Overall, there were minor buffs and nerfs. Mostly negligible. 3.5 Changes: We can no longer use Statsticks. This placed dual-wield, shield, and 2-hand on a roughly equal DPS level. Your options are: Dual wield 2 phys crit swords, one hand + shield, oni-goroshi, or Terminus est. There is no longer 1 best set up (dual used to be best). But generally, Oni-goroshi is highest DPS, dual is fastest clear speed, and lyco is the most simple to gear up. The best shield for DPS is Lycosidae (could be expensive in 3.5), which allows you to not get accuracy that you'd otherwise need on your gear. If using a shield, do not take the dual-wield nodes on the tree! Although expensive, possibly the best option (highest DPS) is to get an onigoroshi. Since this weapon is like a main weapon and a statstick at the same time, it will work very well in 3.5. You will be a little less tanky however. If using an onigoroshi, do not use ele focus, and do not take the dual-wield nodes on the tree! WARNING: This is a slow weapon, so you might not like it. Dual-wield option is the fastest. If you want to try a two-hand weapon, terminus est is cheap and very good for crit builds. Make sure you take the two-hand nodes/mods rather than one-hand or dual-wield. Overall, it has potential to be much higher DPS and easier to control than Flicker Strike. I chose Chieftain to convert to 100% fire without taking Avatar of fire. This means you are still able to deal chaos/cold/lightning damage from Atziri's Flask or Shaper stat-sticks. Chieftain also offers many other fire damage bonuses, as well as tankiness. EDIT: I initially thought that not being able to use multistrike might be a drawback of the skill. I was wrong. Multistrike just doesnt make sense with this skill. It's like if you were able to link multistrike to leap slam. It wouldnt make much sense. Also, do not use ele focus. If you cannot ignite the enemy, Oni-goroshi's buff will not activate. Note that some jewels have dual-wield mods. They dont do anything. Also, the accuracy I have on my rings and amulet can be dropped in exchange for other DPS mods. LV92 Inquisitor Dual-wield version. It is less tanky than Chieftain. Note that about 50% fire resistance is missing because chieftain had that from his ascendancy. LV92 Jugg Dual-wield version. It's really not that different. Jugg needs ele penetration, so use wise oak, so make sure to balance your resists. His DPS advantage is the accuracy from ascendancy. This means you can drop accuracy on gear and invest in something else. You can start using Consecrated Path at LV28. You can buy it in the Library. Unlike flicker strike, you will be able to start using it as soon as you meet the gem level requirements. Before LV28, use other melee skills like Ground slam, Double strike, Sunder, frost blades, molten strike, smite, and Static Strike. Make sure you take resolute technique and respec out of it later when you go crit. Don't pick up any crit nodes until you reach around level 60. You don't necessarily need to use a sword from the very beginning. 3.5 Changes: We can no longer use Statsticks. Just dual wield the 2 best swords you can find, find a shield, or use oni-goroshi. If using a shield or onigoroshi, do not take the dual-wield nodes! Note. I have not traded at all. At this point in leveling, Elemental Focus Support is a better choice than combustion. Later (when you remove resolute technique and start to be crit), replace ele focus with combustion. Also, if you have a 5th link, I suggest increased AOE. 3.5 Changes: We can no longer use Statsticks. Just dual wield the 2 highest Phys DPS weapons you can find while you level. Oni-goroshi works well too. I'm in the process of switching to Crit. I'm using a rare sword but Dreamfeather is a good unique sword option too. I took the AOE nodes near templar, which helped a lot. Use blood rage! Note that Warchief cant be supported by inc duration. Use ele damage with attacks instead. The best 5-link at this point would be CP - Melee phys - Ele attack - Combustion - Increased AOE. The AOE is really nice. Swap AOE with Conc effect vs tough bosses. Ruthless or damage on full life for 6th link. If you are struggling with mana, Ruthless has a lower mana cost. 3.5 Changes: We can no longer use Statsticks. Just dual wield the 2 best swords you can find, Oni-goroshi, or find a shield. Lycosidae is the best shield option for DPS. My gear is still bad and I have the currency to upgrade, but I dont feel the need. I feel tanky and I'm killing bosses fast. 4-link Vaal Warchief is really nice. Tombfist dropped! My sceptre has ele damage, ele attack damage, phys as fire, crit multi --- all good damage stats. I got pretty good jewels --- they are very important. Note that Warchief cant be supported by inc duration. Use ele damage with attacks instead. The 6th link can either be Ruthless or damage on full life. If you are struggling with mana, Ruthless has a lower mana cost. Damage on full life is more DPS (when you are on full life, which should be most of the time). For max DPS, link combustion to totem, and using ele focus instead of combustion on your main links is better. The totem can ignite the enemy which reduces their fire res. Gearing gets more complicating after LV70 because you remove the Resolute technique node and go crit. Plus, more nice gear becomes accessible. 1) Make sure you have enough accuracy on your gear before removing Resolute technique and going crit. You always need 90% hit chance in your hideout. This will decrease as you level, so be careful. Try to get 250+ accuracy on at least 3 pieces of gear. 2) Flasks. They double your DPS and provide extremely important defenses. Make sure you have good ones. Check the flask section. 3) Jewels. Many people do not have good jewels. See jewel section. You just have to click the trade button. 4) Mana running out. Before level 70 or so, you will need a mana flask. Afterwards, Make sure you have 1 mana leech node (more will not help), and you have enough DPS. Also, dont forget to take the 2 mana/flask nodes. 5) "Ideal" 6 link. It doesnt really exist. There are drawbacks to the highest DPS setup, which includes using ele focus and damage on full life. It will be harder to generate endurance charges and you will do less damage when not on full life. Conc effect is high damage but obviously your area will shrink. Although Ruthless is not as much damage, it is still a good alternative, especially given its low mana multiplier. Combustion is possibly the single best support gem, but it can be linked to the totem. 6) Sword. Your sword needs crit chance, not just high PDPS. See sword section. At this point, the build is close to finished. Not perfect, but upgrades could get very pricey. - I swap Silver flask with Wise Oak for more damage and defense. Make sure Fire resist is the highest, and cold resist is the lowest. - Give combustion to the totem and link the ele focus to CP. Totem can ignite the boss for negative fire resist. - Swap Conc effect and Inc AOE. - use ralekesh boots for charges. - I usually don't use this but I could link cull to the totem instead of the ice golem in the last Shaper phase. It took me many attempts to beat Uber Elder. This was my first kill. In my opinion, the 3 main things that kill you are stuns, slows, and Shaper balls. I solved stuns and slows with Kaom's roots, and Shaper balls with spell dodge. 3.5 Changes: We can no longer use Statsticks. So my gear set up will no longer work well. Just dual wield the 2 best swords you can find, or find a shield. Lycosidae is the best shield option for DPS. Oni-goroshi works well too. --Because of Kaom's roots, I had to remove tombfist and get rare gloves with resists and 4 sockets. --With my 6 link, I didn't use conc effect because I found it easier to position myself that way. Look for high attack speed (>1.85), high crit chance (>6.3%), and high pDPS (>220). If you get a worse one than these, then Scaeva or dreamdeather will be better. When you have a lot of currency, look for something like APS > 1.9, crit chance > 6.7%, pDPS > 260. People tend to evaluate weapons purely based on its pDPS, but that is quite wrong. You need 1. attack speed, 2. crit chance, and 3. pDPS for a weapon to be good, ESPECIALLY for this build. Scaeva literally has the same pDPS as the weapon I'm using above (280 pDPS). But what's wrong with it? The attack speed. Mine is 2.03 and scaeva is 1.3. When you get any sources of added damage, attack speed is extremely important. The herald of purity that we're all using adds phys damage: "Adds 25 to 37 physical damage to attacks"
This means, it adds an average of (25+37)/2=31 phys damage to every hit with your sword. How does this affect my fast sword vs Scaeva? - For Scaeva, the actual pDPS rises from its base 280 to: 280 + 1.3*31 = 320. - For my sword, the actual pDPS rises from its base 280 to: 280 + 2.03*31 = 343. So, my sword ends up having higher pDPS than Scaeva in the end. Of course, I have added phys damage from many other sources (rings/amulet/abyss jewels/loreweave), which all make my sword even better than scaeva. Ok what about crit chance? Let's say we took a total of 455% crit chance on the tree from all the nodes. I think that's what I have on the tree if I added right. - For Scaeva, the actual crit chance rises from its base 6% to: 0.06 x (1 + 4.55) = 0.333 (33.3%). With a diamond flask, the chance rises to: 1-(1-.333)^2 = 0.555 (55.5%). - For my sword, the actual crit chance rises from its base 6.87% to: 0.0687 x (1 + 4.55) = 0.381. With a diamond flask, the chance rises to: 1-(1-0.381)^2 = 0.617 (61.7%). So in the end, I'm not critting 0.87% more of the time. I'm actually critting about 6% more. So the tiny differences matter a lot. Keep in mind this crit chance (61.7%) decreases a lot if the accuracy is low, but that's a separate issue from how to find a good sword. You want at least 2 Crit Multi mods on each jewel. They are crucial for DPS. There's many tags that work, so decent jewels are pretty cheap. Other mods you want might be atk speed, res, int/dex, life, increased damage, fire damage, area damage, etc. I'm finding that the people that follow this guide tend to neglect flasks. For me, my flasks double my DPS. They can also save you from lethal mechanics, so they are VERY important. Make sure your life flask is an instant flask. Like most builds, you will want unbleed, uncurse, and unfreeze flasks. Diamond flask is necessary as this is a crit build. Silver, Atziri's Promise, Taste of Hate, Wise Oak, and Lion's Roar are your damage flask options. MAKE SURE YOU 20% QUALITY ALL FLASKS! Sin's Rebirth is actually not so good because the damage does not scale off of ele damage. Bandits: 2 Passives or Alira. I took Alira. Mana regen is pretty nice. Pantheon: There is no 1 best choice, and they are all useful. Just take something you like. 1. Ele focus will prevent the combustion buff. Combustion is better than ele focus for both DPS and mana. 2. Lava Lash is too far away, so its worth is questionable. There is a 5% pen node 3 points away. And Primeval Force is also close by. 3. Endurance charge gives 18% more Tectonic damage, yea, but Consecrated Path gives 20% more damage if the enemy is right next to you. Also, my DPS should be higher because I need to fit in the new Herald of Purity. It will add a ton of damage. 3. 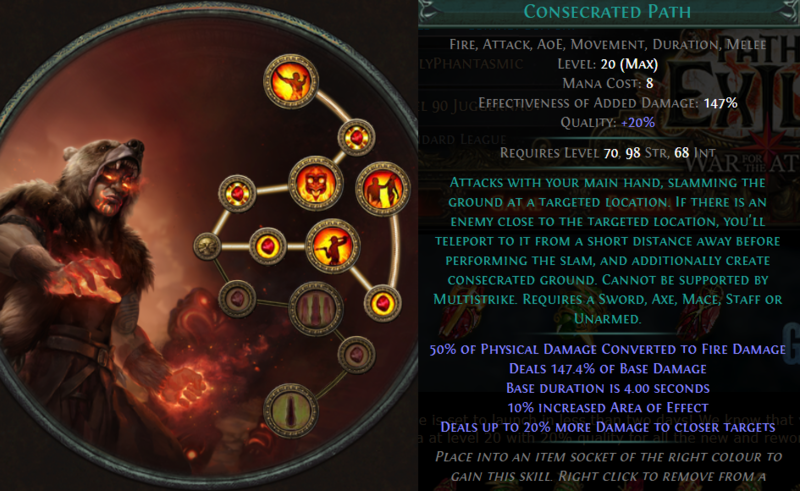 Endurance charge gives 16% more Tectonic damage, yea, but Consecrated Path gives 20% more damage if the enemy is right next to you. I am also hyped for consecreated path, but I dont see how the DPS would get anywhere near flicker strike. The frenzy charges alone (curse and blessing alike) aswell as the inherit flicker strike higher base damage, the 20% more attackspeed aswell as the additional 10% attackspeed per charge result in an DPS I just cant see in the current description of the skill. Statsticks wont change that, missing multistrike wont help either. I do hope for it to be easier to control (good for delve mechanic) aswell as opening great fire AOE build out of it, aswell as support mechanics. Makes it more interesting to chieftains, inquisitors and the like. Nice to see other people crafting around the skill though, gl! is there any preview of this skill ? Only preview I have seen is in ZiggyD templar minion video. He only used consecrated path once towards the end of the video. Hi. The Berserker Leech is hardly an advantage. The leech nodes are a 1 point node. Plus, Chieftain gets free fire leech too. Berserker will need to be built differently. He gets damage but also takes a lot of damage. And he does not have the fire-specific mods like chieftain. Instead of Phys-to-lightning, which is a wasted support gem, just take the 40% cold conversion on the tree plus get a sceptre with phys as extra lightning (If you really want to use inpulsas that much). But, I imagine herald of ash + Increased AOE gem will clear as well as inpulsas. If you are going to use berserker this league, you should try focusing on the warcries, because that was the key buff to berserker. Make sure you take the new war cry nodes. It should be interesting. See this video from the 10 minute mark.